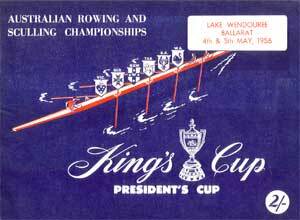 The eights race was rowed over the Olympic distance of 2000 metres for the first time on the Olympic course at Ballarat. SA and Tasmania were eliminated in the repechages. In the final WA got the best start but Victoria took the lead off them quickly with both NSW and WA pressing closely. By the 1000 metres, Victoria had a 3/4 length lead from NSW. The NSW crew had a big effort through the third 500 metres to bridge the gap. This was repelled with 400 metres to go by the Victorians who won by 3/4 length. 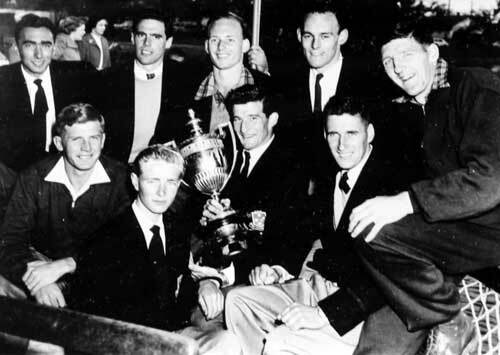 The sculling race allowed several scullers from each State because it was the selection event for the 1956 Olympic Games. 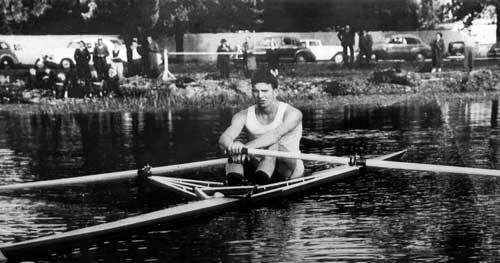 In the final, Hubbard lead early but was quickly taken by both Mackenzie and Wood. These two scullers then started a great struggle with Mackenzie leading by a length at the 1000 metre mark. Mackenzie then drew away to win by 3 lengths. R: 1st Squires, 2nd Goswell, 3rd Machin, 4th Dudgeon, time 8:12.4, margins 3 and 4 lengths. No margin for last place.